Another card for today, enjoy. I started by filling the Stampin’ Spritzer Bottles with alcohol and the re-inkers, then I sprayed my white piece of cardstock. 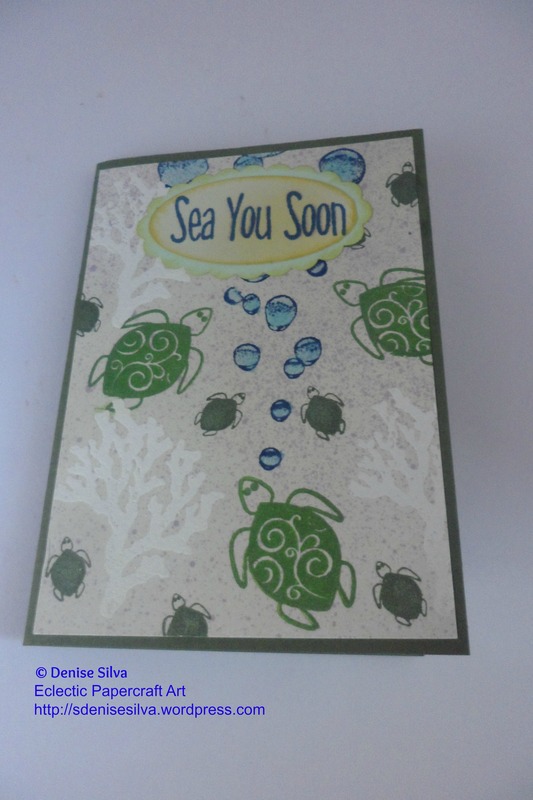 I then stamped the corals with the Whisper White ink, but I didn’t like the result, so I put some white embossing powder on top of the ink and heat embossed it. 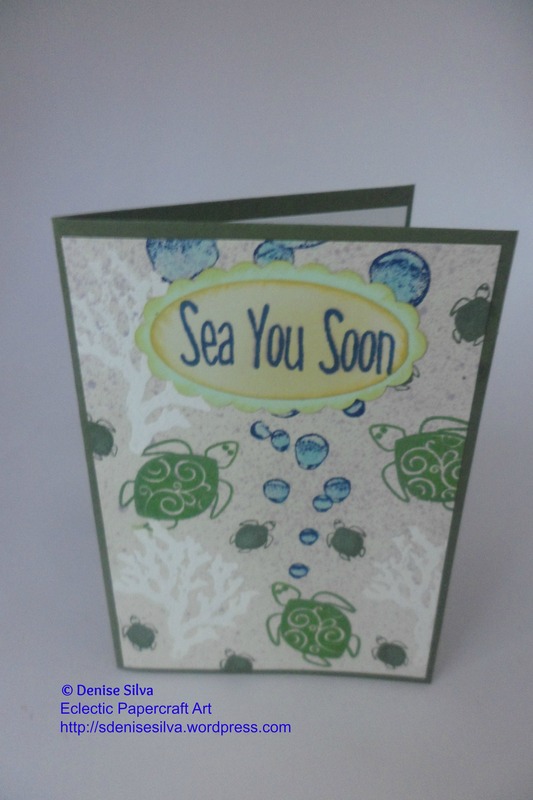 Next I stamped the bubbles, followed by the turtles. I filled in the bubbles with a wet brush and the Tumbled Glass distress ink. Last I stamped the sentence on a distressed piece of scrap paper, Punched it out with the Oval Large punch, sponged the edges. Punched out another piece of scrap paper with the Oval Scallop punch to layer it behind my sentence, and assembled everything with liquid glue. 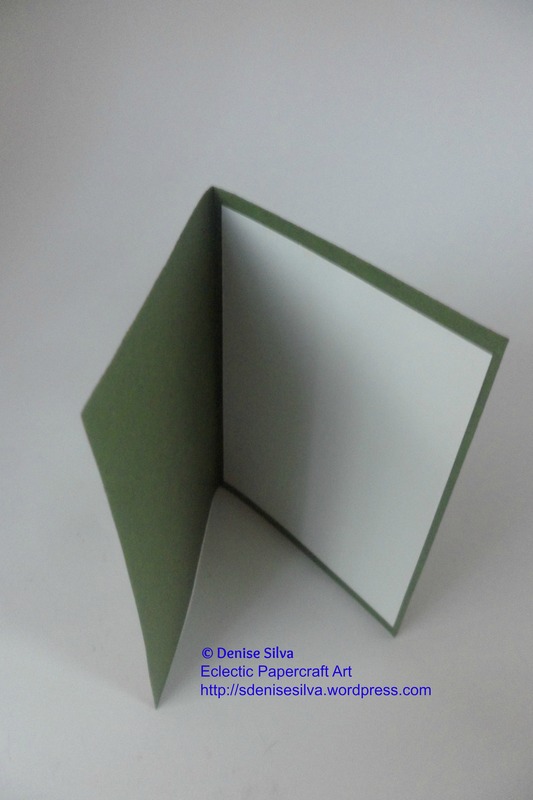 Once again, because the cardstock is dark, I added a layer of white paper on the inside. This entry was posted in Cards and tagged Handmade card, handmade presents and gifts, Inking, paper art, papercraft, Stampin' Up!, Stamping. Bookmark the permalink. so pretty! 🙂 can i use this for one of my listings? i’ll send you a coupon code!